Gobbles — the sounds that turkeys make — can be heard more than a mile away. Adult wild male turkeys have a prominent tuft of hairlike bristles resembling a beard projecting downward from their chests. Beards can grow 9 to 18 inches long. Interestingly, 10 percent to 20 percent of hens also grow beards. No one knows what they are for, but they are presumed to play a role in mating and territorial displays. Wild turkeys like to roost in trees at night. Male (called gobblers or toms) and female turkeys (hens) have caruncles, which are growths on the throat region that turn bright red when the turkeys are distraught or during courtship. Males and females have snoods — flap of skins that hang over their beaks and can be voluntarily contracted. 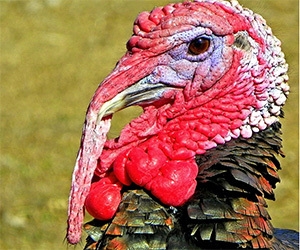 Snoods, which are larger in males, also turn bright red when the turkey is upset or courting a mate. All tail feathers of an adult tom’s tail are the same length — about 12 inches. The feathers forming the center of an immature male’s tail (younger males are called jakes) are usually longer than the rest of the feathers in the tail. Males strut around shaking their feathers, doing the “turkey trot,” to help them attract females for mating. There are at least 15 wild turkey vocalizations. Wild turkeys can fly well. Since many of their bones, including those in the skull, are filled with air to make them lighter for flight, their skeletons are only about 5 percent of their body weight. On the other hand, domesticated turkeys, because they have been selectively bred to be heavier birds destined for the dinner table, usually can’t fly. Wild turkeys have been recorded flying as fast as 55 miles per hour.